A Star Is Born has already received innumerable honors, awards, and nominations. Hurry to own your own personal copy so that you can say you owned it before the sweep of Oscar wins! When a project lingers in development too long, its ultimate demise seems inevitable. Along the way, a veritable who's who of directors and leading players are often attached and this was the case of the latest version of "A Star Is Born." Ultimately, Bradley Cooper (American Hustle; Hangover; Alias) was ready to make his long anticipated directorial debut; and, he would take no less than Lady Gaga (American Horror Story) in the lead. Produced by Warner Bros. Pictures, the screenplay was written by Eli Roth, Bradley Cooper, and Will Fetters (and based on a screenplay, and a story by numerous other writers); AND, with original music written by Lady Gaga, Cooper, and Lukas Nelson (Willie's kid) --- Jason Isbell and Mark Ronson, also contribute. Now, Warner Bros. Home Entertainment brings the magic home on 4K Blu-Ray, Blu-Ray and DVD Why make another? After all the theme has been threaded through many a story in addition to the four titular A Star Is Born films, and the Bollywood hit, Aashiqui 2. It's a classic plot with so many story elements to exploit while remaining relatable. Perhaps, that is why since the original's release in 1937, we've seen it re-interpreted every couple/few decades. While it is the same basic outline of the story, each places one of the greatest female talents of the time in an updated surrounding representative of the current times. Sure there are telltale signs of the times in this adaptation, but the core of the film and the essence of the relationship(s) are timeless. Cooper has long dreamed of directing but wanted the right film. He has discussed as much in interviews. Given the apparent ease with which some celebrities are able to bounce around within (and outside) of the industry to realize a pet project or new role on a whim, it is mildly surprising that he hadn't been given (or, merely taken) the opportunity to direct before. ‘Tis kismet that he took the time to navigate the industry, and learn from both the best and worst. The exposure during his considerable acting career has helped him hone his keen vision, and gain invaluable insight. In order to give authenticity to his character, Jackson "Jack" Maine, Cooper sought the expertise, and training of Lukas Nelson who even provided his band, Promise of the Real, as Jack's musicians in the movie. Early on, Nelson wrote and submitted some songs for the film. He would then go on to co-write additional songs with both Cooper and Gaga. There are some subtle nods to the 1976 version throughout, but perhaps, most notably is the cache of anthemic ballads, which together harken back to another era of soundtracks. Once again, we have a fully immersible soundtrack to experience from beginning to end as a whole rather than fragmented pieces strung together based on appearance within a film. Some of us can still recall the ubiquity of Barbra Streisand's Evergreen from the 1976 version (fun fact: it was the first Dolby Surround Sound film). Yet, there is no lament for bygone Oscar worthy tunes. That is because the new music from this 2018 A Star Is Born is instantly compelling, musically mesmerizing, and soul satisfying. The writing captures the struggle, and passion of the characters in its notes, and through the lyrics. Securing Lady Gaga to contribute was pure genius, luck, or both. Surely, we're all familiar with her deft writing skills from her prolific music catalog. Her acting resume, on the other hand, has been limited in both breadth and depth. Performing musically in front of audiences of countless numbers, on stage and on camera is nothing new for Gaga. Usually she is protected by the facade of make-up and costume; the "gimmick" tied to her latest project. Here, however, she is stripped of all those distracting trappings allowing her music, and amazing vocal range the undivided attention it deserves. The purity of her voice...the raw emotion when she lyrically bares her soul...the nuances in character that fully capture the essence of Ally's self, and an honest portrayal of her journey draws the audience in and keeps us captivated. Again, as with Cooper, this project was destined to highlight and unveil the magnitude of talent an individual has yet to reveal. The undeniable chemistry on screen was no doubt the catalyst for rumors that the two leading actors had extended their romance beyond the screen. It is an inevitable mill pitfall when actors do their job almost too well. True, too, is the need for actors to have their own backstory and store of knowledge/experience from which to draw upon. There was no shortage of this here. While the trajectory of the story and its basic plot are far from new, this film draws upon the actors' personal history for a prophetic and touching interpretation. Cooper, who stars and directs, has battled substance abuse and emotional wellness proving that these issues do not discriminate based on looks, talent, and success. (Unlike some ignorant theatrical review I had read in which the writer proclaimed that Cooper was "too handsome" to be an addict.) Gaga, too, has been vocal about her past struggles and one can only hope the film will serve to open a dialogue for some who need it. All of the performances in this film were done live so as to capture them without the distraction of lip synching and looping that can inevitably mar an otherwise spectacular scene. The concert scenes were also shot at large venues where many notable musicians were performing including a Willie Neslon concert, and Coachella where Lady Gaga was the first female headliner in 10 years. Gaga also drew on a devastating personal experience that occurred during filming. Her final scene in which she sings the moving "I'll Never Love Again" was filmed just as her close childhood friend had passed. Of course, the immense talent and superb performances are not limited to the leads. The film also stars Sam Elliott (Road House/Tombstone/The Quick and the Dead) as Jack's brother/manager Bobby, Dave Chappelle (Chi-Raq/You've Got Mail) as Jackson's friend, and Andrew Dice Clay (Entourage/Adventures of Ford Fairlane) as Ally's Dad. The film takes advantage of the Dolby Vision HDR with 2160p resolution and a 2.40:1 aspect ratio. From the intimate moments in hotel rooms or the privacy of Jackson's home to the vast array of concert venues, the details are sharp and the color palette is clean. Complementing the video is a Dolby Atmos Audio soundtrack that sounds so layered and textured that it also help sets the scenes just as much as the visuals. The combo pack comes with some special features, which include "Jam Sessions and Rarities" of some amazing tunes (Baby What You Want Me To Do; Midnight Special; and, Is That Alright?) as well as a few music videos of the films hottest songs (Shallow; Always Remember Us This Way; Look What I Found; and, I'll Never Love Again). Additionally, there is a behind the scenes sort of special feature "The Road to Stardom: Making A Star Is Born." The main feature also comes with subtitle options in English SDH, French, and Spanish. The film has already received innumerable honors, awards, and nominations including a few 2019 Grammy Awards, and yet to be determined Academy Awards. Hurry to own your own personal copy so that you can say you owned it before the sweep of Oscar wins! 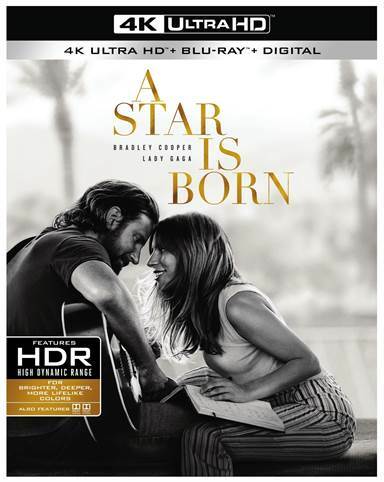 Download A Star Is Born from the iTunes Store in Digial HD. For more information about A Star Is Born visit the FlickDirect Movie Database.